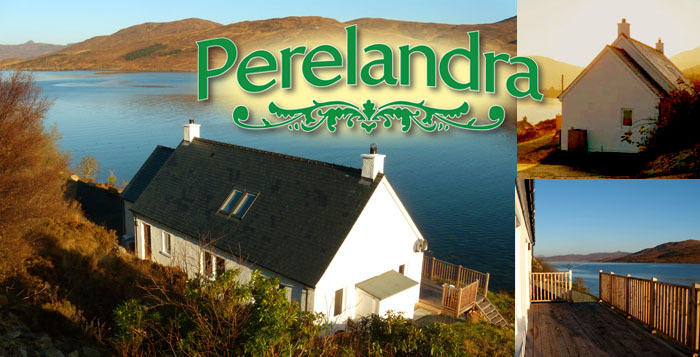 Booking Bed and Breakfast at Perelandra, Isle of Skye. For last-minute bookings within 2 days of arrival please phone. Looking for self-catering accommodation? Try Otters Leap, at Luib, Skye. If you'd prefer to talk to us first and book conventionally by telephone or email that's fine too. Email us, telephone or send a message using our Contact form to check availability and prices. We'll then reserve the room for you pending receipt of your deposit. This will take a little longer, because it requires an interchange of emails and we are not at the computer all the time. To secure your booking we ask for a deposit equivalent to the cost of your first night's stay. For website bookings you'll be taken to a payment page to make your payment by debit or credit card via PayPal. It is not necessary to have a PayPal account to make your payment. If you are booking by email or telephone, we'll request the deposit separately. This can be paid by PayPal, by direct transfer of money into our bank account (details on request), or by Postal Order or cash. You can also pay by UK cheque if this reaches us two weeks or more before your stay. Please note that your payment is non-refundable unless we can re-let your room. To help us to do this (and save your money!) please let us know straight away if you realise you will not be able to stay with us as planned. If your booking is for more than one night and you cancel or curtail your stay giving less than 2 days' notice then we reserve the right to invoice you for the remainder of the cost of your stay, unless we are able to re-let your rooms. Please consider taking out holiday insurance! Policies are commonly available for a few pounds that will cover you against cancellation charges if the worst should happen. If you do have to cancel your accommodation we would be more than happy to supply you with a Cancellation Invoice for you to present to your insurance company. No-shows: If you fail to turn up, without warning, for the first night of a multi-night stay we will cancel the remainder of your stay unless we hear from you before 10am on the following morning. Check-in and Check-out: Please check-in no earlier than 4.00pm on your arrival day. Check-out is by 10.00am on your departure day. Cancellation by us: In the unlikely event of Perelandra having to cancel your booking (e.g. because of fire or serious illness) our liability is limited to the cost of any money you have paid to us.